The Plaza de la Independencia hosted this Tuesday night, the inauguration of the International Poetry Festival of Granada with a concert and poetry recital. The stars of the night were the poet/priest Ernesto Cardenal and the singer/songwriter/writer Luis Eduardo Aute, both received the public’s ovation. Cardenal was the first poet to recite in the eleventh edition of the Festival with his verses about the Great Cocibolca Lake; Aute interpreted three songs, one of them was “Rosas en el Mar” is the most famous one in his repertoire. 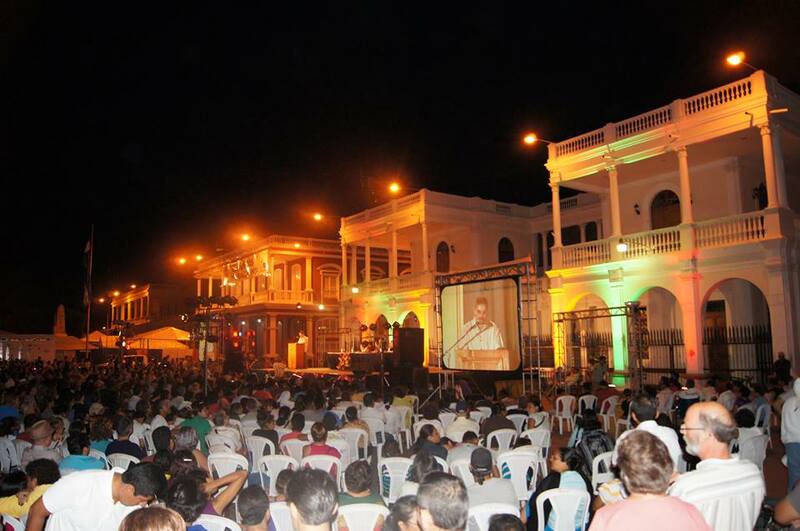 The Poetry celebration was thus inaugurated in this colonial city founded on 1524 by Francisco Hernández de Cordoba. The Spaniard Aute emphasized Granada’s beauty: “It’s my first time in Nicaragua and Granada, but in the few hours I have spent here, I can see a beautiful city”. “I am very happy, I feel like home” said the artist while also congratulating the organizers for putting together one of the most important cultural events in Central America. The act was presided over by the Festival’s president Francisco de Asis Fernandez, the poet Gioconda Belli, diplomatic representatives from the European Union and the president of the Private Sector’s Council, Jose Adan Aguerri. “This is the celebration of the dignity of the word, of the testimony of the time that we are living in…” said Fernández. He added, “Granada’s International Poetry Festival represents an annual report of the world’s poetry”. This year there are poets from 51 countries, who will be reciting in the different activities planned for the following days. Verses started filling the streets since this past Sunday, when the poets arrived. On Monday there was an open mike in the Plaza Los Leones, amateur and professional writers read their poems. On Tuesday evening famous songs like “Cristo de Palacagüina”, “El almendro de onde la Tere” and “Quincho Barrilete” were performed by their author, Carlos Mejia Godoy. Hundreds of people gathered at La Plaza de la Independencia. To know more about the Festival’s activities check out the official schedule here.